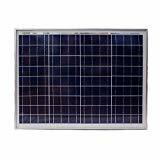 Mighty Max Solar is excited to bring you this 50 Watt 12V Polycrystalline Solar panel. Mighty Max solar panels offer you a totally new definition to the word “compact”. Their sleek design, compact body, pre-drilled holes makes this panel a breeze for portability of an off-grid system on the road or your family’s favorite camp site! Mighty Max Solar delivers exactly what is advertised! You’ll receive 50 Watts of solar energy in this panel, not less, like other leading manufacturers. We stand by our product and its performance. When you buy Mighty Max Solar, you’re buying with confidence to keep your electrical needs running.